Here on Smark Henry, we cover mostly the big American and Japanese promotions, so for this week on #MustWatchMonday, I've decided to introduce you guys to a bit of European wrestling, which is currently experiencing a bit of a boom. One of the promotions leading the charge for this European surge is Revolution Pro Wrestling, or RPW. Founded in 2012 by Andy Quildan, it was an offshoot of the older International Pro Wrestling: UK, but has quickly become the most prevalent promotion in the UK. RPW has had working relationships with other major promotions such as ROH and NJPW, and has had big names work for it, such as AJ Styles, Shinsuke Nakamura, Michael Elgin, and Tomohiro Ishii. Some of the more well known names to come out of RPW are Zack Sabre, Jr., Marty Scurll and Will Ospreay, who some may know is challenging KUSHIDA at NJPW Invasion Attack for the IWGP Junior Heavyweight title. One of the best rivalries to come out of this company is that of Will Ospreay and Marty Scurll. 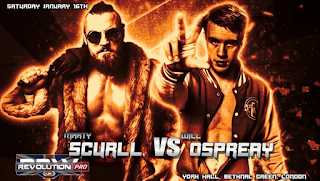 Will Ospreay, otherwise known as the Aerial Assassin, is only 22 years old, and is quickly becoming one of the world's premier wrestlers, having wrestled in promotions like PWG, TNA, WxW, EVOLVE, and many more. As suggested by his moniker, he employs a high flying style, using a 630 Splash as his finisher. Marty Scurll made his debut much earlier than Ospreay, having wrestled since 2005. Nicknamed "The Villain," Scurll employs a more ground-and-pound and submission-based offense, centered around his Crossface Chickenwing. Scurll and Ospreay have been feuding for the better part of two years, mostly over getting prominent positions and title matches in RPW. In this PPV called High Stakes, Ospreay and Scurll were fighting for two things. First, to be the number one contender for the RPW British Heavyweight Championship, and second, to be the first RPW to get an action figure made of him. This match went on for 28 minutes, but felt much shorter than that. Having wrestled each other 12 times, they knew each other's styles perfectly, employing counters and reversals throughout the match, even using each other's finishers. The overarching story during the match itself was Ospreay's overconfidence in going up against Scurll. Every time he got him down, he would play to the crowd, get them to cheer, and fail to keep up the offense against Scurll. This lack of focus was his downfall, as Scurll kept up the attack when he was on offense, and always had an answer for Ospreay's high flying. By the time Ospreay was fully focused it was too late; Scurll had the advantage, and eventually got the win. The match keeps you engaged all throughout, whether you're a first time viewer of these two wrestlers or have been keeping up with the RPW product for quite a while. Do you want to hear more about European wrestling? What do you think about this match? Leave a comment! Brandon Sy is a PhD student in Biochemistry and Molecular Genetics currently based in Sydney. Since he wasn't allowed to watch wrestling as a kid, he's been overcompensating ever since. Despite being a huge fan of Japanese wrestling, he still holds a soft spot in his heart for WWE's Kane. He's good for recommending matches from pretty much anywhere, whether it be Japan, Europe, the US or Mexico. He'd be ecstatic if you watched Dragon Gate though.